6 Users Like This Post. Heaven knows we've waited patiently enough. Sounds like a Christmas opening with a world tour (inc West End stop)?! Yeah West End. Wanna book now! Me too!!!! By hook or by crook I WILL BE THERE. Some of the arrangements - the one's I've heard, at least - are sounding INCREDIBLE. Like NOTHING you've heard before (not literally, obviously, otherwise that'd be a whole OTHER musical). How exciting... how have you heard some? Well, as some of you know, I've been in the extremely fortunate position to have worked on several aspects of the musical with Jim. I've been doing it - on the basis of 'whenever Jim asks me to' - for almost two years now. It's long overdue, great news!! There's so much I could ask you but your lips are probably sealed!! I'll speak a bit more about my involvement closer to the time, subject to Jim's approval. I'll leave you with this: BAT OUT OF HELL is NOT going to be 'just a typical musical'. It ISN'T We Will Rock You, that's for sure. It's both GENRE and FORMAT breaking. The script is tight, and they're doing things that have never been done in musical theater before. And beyond that -- you'll have to wait and see. People will think BOOH is a jukebox musical when it's not - these songs were all written for this story from the word go. I'm not sure if that will do damage or work to the show's advantage? The musical will be a success or a flop. I don't see any middle grouned with this. I can't wait to see which songs make it and how they make up the story! It will in some form be Jim's Neverland project, which he's been developing since like 1974 or something, and even before that when it was "The Dream Engine", some of which will be heard in some form on Meat's new album. Jim thinks that Peter Pan is the ultimate basis for a rock and roll musical and for many years it's been in the worx either as a film or a theatre piece. I just hope he and everyone's OK with it though. It seems to be my thought at this point that people will want a "Bat" show and it'll get the interest either way, because hello "Bat out of Hell: The Musical" on the West End. I have always thought done right it was the big blockbuster musical that never was, on the basis of the first two albums, with a few other new songs from Bat 3 & What would be THE FINAL FLIGHT or Conclusions & Climaxes as it's been called. "THE FINAL FLIGHT" I think was a way of making "FINAL AT BAT" sound more formal? I'm babbling on here, I'm sorry....... But I do believe that "Neverland", I'm sorry BOOH haha, will in SOME form be the realization of that concept. Now whether or not I personally am blown away by it, remains to be seen, but I would hope so, that I would at least be happy with it. With Jim and that style of music, there's a lot of passion. And I think the REAL and WORST kind of failure with Jim is feeling INDIFFERENT. I truly hope to G*d this is a great success. 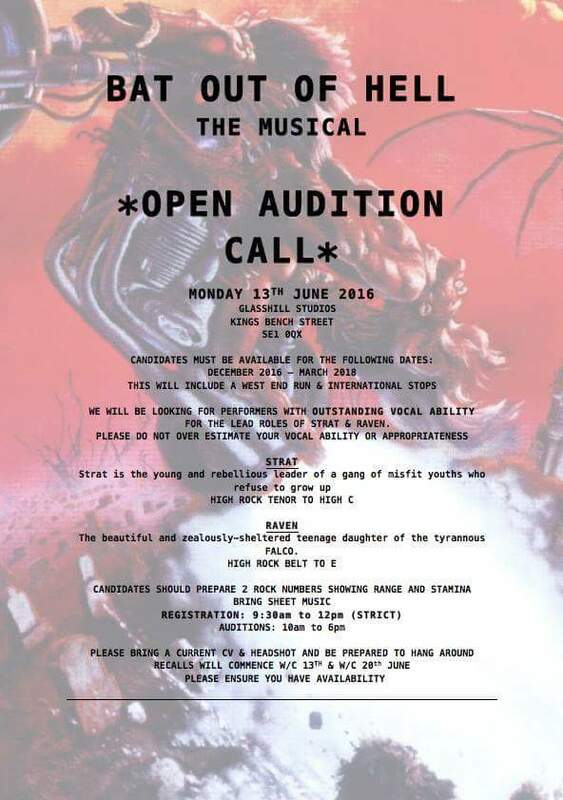 I had assumed BTWA would have included the songs planned for BAT OUT OF HELL III: THE FINAL AT BAT or whatever it would have been called (What Part of My Body, Still The Children, Paradise Found etc) but it seems the team have taken a very different creative route. Not that I'm complaining as I know the album is still a revisitation into the extraordinary world. No doubt BOOH:TM will have a soundtrack album at least, if not a concept album with the new songs on it. As much as I love Meat and the albums this show is the culmination of why they exist. Tease... this is going to be different. Is it just songs from the BAT albums or are new songs like What Part of My Body/Still THe Children in there? You'll have to wait and see ... (but you won't be disappointed). Page generated in 0.07628 seconds with 14 queries.